Garrett Gilbert (born July 1, 1991) is an American football quarterback for the Orlando Apollos of the Alliance of American Football (AAF). He was drafted by the St. Louis Rams in the sixth round of the 2014 NFL Draft. He played college football at Texas and SMU. Gilbert has also been a member of the New England Patriots, St. Louis Rams, Detroit Lions, Oakland Raiders, and Carolina Panthers. Gilbert was regarded as one of the best high school quarterbacks of his class and was named the 2008 Offensive Player of the Year by USA Today. He holds two records at Texas. The son of former NFL quarterback Gale Gilbert, he attended Lake Travis High School in Austin, Texas, where he broke the state record for most passing yards in a season with 4,827 yards during his junior season. The record was previously held by Graham Harrell. Gilbert again broke the same record his senior season, after compiling 4,851 passing yards and leading the top team in the state to another state championship. He finished his high school career with 12,537 passing yards, another state record which was previously held by Harrell. Gilbert throwing a pass in a playoff game against Killeen High School. 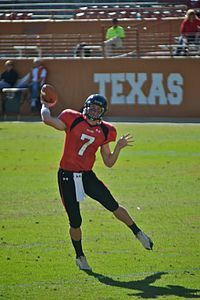 Garrett Gilbert (born July 1, 1991) is an American football quarterback for the Orlando Apollos of the Alliance of American Football (AAF). He was drafted by the St. Louis Rams in the sixth round of the 2014 NFL Draft. He played college football at Texas and SMU. Gilbert has also been a member of the New England Patriots, St. Louis Rams, Detroit Lions, Oakland Raiders, and Carolina Panthers. On top of the coaching change, Gilbert had to undergo minor shoulder surgery, which took five months to recover. He was not able to lift weights during the five-month period, and instead performed rehabilitation exercises. Gilbert recovered in time to play the first game of the 2008 season. Gilbert completed his high school career setting a state record of 12,534 passing yards, breaking the previous mark set by Graham Harrell by two-yards. Gilbert initially was indifferent to breaking the record when he had the chance during the 2008 state title game; he only did so after his coach insisted. Gilbert finished second to Harrell for career touchdowns, completions and attempts. He led his Cavaliers to a 39–4 combined record as a starter from his sophomore through senior seasons. Along with 79 other high school seniors, Gilbert played in the 2009 Under Armour All-America Game on January 4, 2009. In the nationally televised matchup, Gilbert completed 11-of-22 passes for 161 yards and an interception as he guided the Black team in its 27–16 loss to the White team. In January 2009, a Scouts Inc. reporter predicted Gilbert would win the Heisman Trophy before his collegiate senior season. Gilbert verbally committed to play college football for the Texas Longhorns on February 7, 2008, the day after he received the offer in the mail. He always had aspirations to play for Texas since he was a child. During his youth, he pretended to play football for the Longhorns, passing the football to himself in his living room and diving onto the couch to catch it. When he was eight, he had the chance to play catch with then-Texas quarterback Major Applewhite, whom he considered his idol growing up. His family members were also season ticket-holders. Gilbert was rated as a five-star prospect by Rivals.com. Alongside Matt Barkley of Mater Dei High School in California, Gilbert was the premier quarterback prospect of the class of 2009. Former college head coach Jackie Sherrill called Gilbert the best quarterback he has seen since Dan Marino. It was at first thought that Gilbert would likely redshirt in 2009 and compete for the starting job in 2010. However, since former backup quarterback John Chiles was moved to wide receiver, Gilbert competed with Sherrod Harris for the backup job during the off-season. On August 23, 2009, Gilbert became the second-string quarterback as a true freshman, in front of the junior Harris. In the 2009 season opener against Louisiana-Monroe, Gilbert lined up behind center during the fourth quarter and drove the Longhorns down the field, completing four-of-five passes for 46 yards, before scoring a twelve-yard rushing touchdown on a quarterback draw play to end the drive. On January 7, 2010, in the BCS National Championship Game, Gilbert replaced the injured Colt McCoy. Gilbert completed 15-of-40 passes for 186 yards, two touchdowns, and four interceptions. One analyst took the position that his stat line did not reflect how well he actually played (even though he was responsible for five turnovers – the four interceptions and a lost fumble), and that several of his passes that should have been caught were dropped. 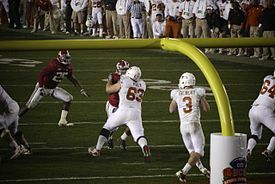 Gilbert led the Longhorns to two scoring drives in the second half to spark a comeback, bringing the score to 24–21 Alabama. However, the comeback ultimately fell short late in the game with a turnover inside the Texas five–yard line. The Longhorns lost the game 37–21. Gilbert was the starting quarterback during 2010 season. He led the team to a 5–7 record, Texas' first losing season since 1997. Against Kansas State, he threw for 5 interceptions as the Longhorns lost by a score of 39–14. In that game, Kansas State also only attempted four passes. Soon after that year's bowl season, Mack Brown announced that every job was up for grabs, leaving Gilbert to compete with sophomores Case McCoy and Conner Wood, as well as freshman David Ash. On August 29, it was announced that Gilbert would retain the starting position in the season opener against Rice. However, on September 12, it was announced that he was being demoted to the second-string quarterback behind McCoy and Ash, who would share the starting position. On September 20, it was announced that Gilbert underwent successful surgery on his shoulder and was ruled out the remainder of the season. Gilbert was granted his unconditional release from Texas on October 5, allowing him the opportunity to seek a transfer. Later that day, he was seen at Southern Methodist University (SMU), watching the football team practice. He completed his degree at Texas and transferred to SMU for the 2012 season. Gilbert won the starting job at SMU, where he ran June Jones's run and shoot offense. He began the season with an inconsistent performance at Baylor, throwing two interceptions in the 59–24 loss. As the season progressed, Gilbert gained confidence, completing four touchdown passes against Houston en route to a 72–42 win, a game which set the SMU record for points in a game. He had his best game of the season the following week against Memphis, throwing for 353 yards with one passing touchdown and two rushing touchdowns. Overall, he finished the 2012 season with 2,932 passing yards, 15 touchdowns, and 15 interceptions. Gilbert was selected in the sixth round (214th overall) of the 2014 NFL Draft, the St. Louis Rams. He was released during final cuts on August 29, 2014. He was signed to the Rams' practice squad on September 1, 2014. He was cut from the practice squad on October 30, 2014. On December 17, 2014, the New England Patriots signed Gilbert to their practice squad. He remained on the practice squad when the Patriots defeated the Seattle Seahawks 28–24 in Super Bowl XLIX. One day after being waived by the Patriots, Gilbert was claimed off waivers by the Detroit Lions. He was waived on September 1, 2015. On September 6, 2015, Gilbert was signed to the practice squad of the Oakland Raiders. He was waived on May 24, 2016. On January 2, 2017, he was signed to the Raiders' practice squad after Matt McGloin suffered an injury in the final game of the regular season. Gilbert was to serve as the backup in case McGloin was unable to play in the Wild Card Round. McGloin ended up being active as Connor Cook's backup for the playoff game. Gilbert was released at the end of the season. After working out with the Dallas Cowboys in January, Gilbert signed with the Carolina Panthers on March 24, 2017. He was waived on September 2, 2017, and was signed to the Panthers' practice squad the next day. He was promoted to the active roster, for the first time in his career, on October 16, 2017. After losing the back-up quarterback job to Taylor Heinicke during training camp he was waived on September 1, 2018. Gilbert was re-signed by the Panthers on December 26, 2018 after Cam Newton and Heinicke were both shut down for the season. He served as the backup to Kyle Allen in the Panthers last game of the season. He made his NFL debut in relief of the injured Allen. He completed his first career pass to Ian Thomas for 31 yards. He finished the game with 40 yards passing. On December 31, 2018, Gilbert was waived by the Panthers. On November 27, 2018, Gilbert was drafted by the Orlando Apollos in the Alliance of American Football's quarterback draft. He played for the team during the inaugural 2019 AAF season. During the inaugural game of the 2019 season against the Atlanta Legends, Gilbert went 15 for 25 for 227 yards, with two passing touchdowns and a receiving score in the 40–6 win. He also threw the first touchdown in both Apollos and Alliance history, with a 26-yard toss to Jalin Marshall. In week 2 of the 2019 season, Gilbert won Offensive Player of the Week with a 393-yard, two-touchdown performance in the 37–29 win over the San Antonio Commanders, and set an early AAF record for passing yards in a single game. Gilbert is the son of former NFL quarterback Gale Gilbert. He was born in Buffalo, New York, where his father played for the Bills in the early 1990s as part of the infamous squad that lost four straight Super Bowls. He moved to San Diego, California at age three, when Gale signed with the Chargers (who coincidentally played in the Super Bowl that same year, resulting in a record fifth consecutive championship loss for a player). The family later moved to Austin, Texas in 1996. Garrett has one brother, Griffin, who played football at Texas Christian University. ↑ Doelle, Chris (September 2, 2006). "BONUS – 4A Austin Lake Travis vs. Texas City". Lone Star Gridiron. 1 2 3 4 5 "A truly Fabulous year for Lake Travis' Gilbert". Archived from the original on February 4, 2009. ↑ "Title eludes Lobos: Lake Travis' Gilbert lives up to billing in 48–23 win". ↑ "Under Armour All-America High School Football Game to be Played Jan. 4, 2009, and will be televised on ESPN at 8 p.m. ET". ESPN. April 1, 2008. Archived from the original on July 18, 2008. Retrieved December 28, 2008. ↑ "Team White Tops Team Black, 26–17". ↑ Duarte, Joseph (February 8, 2008). "Lake Travis' Gilbert commits to Texas for 2009". Houston Chronicle. Retrieved February 23, 2008. ↑ Trubow, Alan (January 30, 2008). "Quarterback recruit Gilbert earns fifth star". Austin American-Statesman. Retrieved February 23, 2008. ↑ "Mr. Texas Football Player of the Year – Dave Campbell's Texas Football". www.texasfootball.com. Retrieved January 24, 2019. ↑ "All-USA honors split between Florida, Texas and Hawaii". USA Today. January 1, 2009. Retrieved May 3, 2010. ↑ "Gatorade AOYs: Diggins, Gilbert Take Top Honors – MaxPreps". MaxPreps.com. July 15, 2009. Retrieved January 24, 2019. ↑ "No. 2 Texas Defeats ULM 59–20". University of Louisiana Monroe Athletics. Retrieved January 24, 2019. ↑ "Texas Longhorns Football Record By Year". College Football at Sports-Reference.com. Retrieved January 24, 2019. ↑ "Texas vs. Kansas State – Box Score – November 6, 2010 – ESPN". ESPN.com. ↑ DeCray, Rich (August 29, 2011). "Texas Longhorns Name Starting QB: Garrett Gilbert". Crimson And Cream Machine. Retrieved January 24, 2019. ↑ "Texas QB Gilbert has surgery, out for season". ESPN.com. September 20, 2011. Retrieved January 24, 2019. ↑ "Garrett Gilbert to transfer from Texas". ESPN.com. October 5, 2011. Retrieved October 5, 2011. ↑ Kercheval, Ben (October 5, 2011). "Updated: Garrett Gilbert given unconditional release from UT". NBC Sports. Retrieved October 5, 2011. ↑ "Source: Ex-Texas QB Gilbert to transfer to SMU". ESPN.com. November 1, 2011. Retrieved January 24, 2019. ↑ "SMU at Baylor Box Score, September 2, 2012". College Football at Sports-Reference.com. Retrieved January 24, 2019. ↑ "Houston at SMU Box Score, October 18, 2012". College Football at Sports-Reference.com. Retrieved January 24, 2019. ↑ "Memphis at SMU Box Score, October 27, 2012". College Football at Sports-Reference.com. Retrieved January 24, 2019. ↑ "Garrett Gilbert 2012 Game Log". College Football at Sports-Reference.com. Retrieved January 24, 2019. ↑ "Garrett Gilbert 2013 Game Log". College Football at Sports-Reference.com. Retrieved January 24, 2019. ↑ "Garrett Gilbert". SMUMustangs.com. Retrieved June 17, 2016. ↑ "2014 NFL Draft Listing". Pro-Football-Reference.com. Retrieved January 24, 2019. ↑ Holland, E (October 30, 2014). "Rams waive former SMU quarterback Garrett Gilbert". Retrieved December 8, 2014. ↑ "Patriots place DL Dominique Easley on injured reserve; Sign TE Steve Maneri". Patriots.com. December 17, 2014. ↑ "Patriots hold off late Seahawks drive to win Super Bowl". USA TODAY. Retrieved January 24, 2019. ↑ "Report: Patriots waive Garrett Gilbert". June 11, 2015. ↑ Gantt, Darin (June 13, 2015). "Lions make a spot for former Patriots QB Garrett Gilbert". NBCSports.com. Retrieved August 20, 2015. ↑ "Oakland Raiders Sign Wide Receivers Robert Herron and Nathan Palmer". Raiders.com. Retrieved June 17, 2016. ↑ Patra, Kevin (January 2, 2017). "Raiders sign QB Garrett Gilbert to practice squad". nfl.com. Retrieved January 2, 2017. ↑ "Cowboys work out former SMU QB Gilbert, sign 2 receivers to reserve/future list". Retrieved November 26, 2017. ↑ Gantt, Darin (March 24, 2017). "Panthers sign quarterback Garrett Gilbert". ProFootballTalk.NBCSports.com. ↑ Henson, Max (September 2, 2017). "Panthers trim roster to 53". Panthers.com. Archived from the original on September 20, 2017. ↑ Voth, Bill (September 3, 2017). "Panthers sign 10 players to practice squad". Panthers.com. ↑ Alper, Josh (October 16, 2017). "Panthers promote QB Garrett Gilbert from practice squad". ProFootballTalk.NBCSports.com. ↑ Voth, Bill (September 1, 2018). "Panthers trim roster to 53". Panthers.com. ↑ "Panthers place QB Heinicke on IR; sign QB Gilbert". ABC Columbia. December 26, 2018. Retrieved January 24, 2019. ↑ "Carolina Panthers at New Orleans Saints – December 30th, 2018". Pro-Football-Reference.com. Retrieved January 24, 2019. ↑ Smith, Bradley (December 31, 2018). "Panthers sign 13 players to future contracts and waive Garrett Gilbert". Cat Scratch Reader. Retrieved January 24, 2019. ↑ Riccette, Bill (November 28, 2018). "Former Panthers QB Garrett Gilbert selected by AAF's Orlando Apollos". USA Today. Retrieved November 28, 2018. ↑ "Orlando Apollos Set Final Roster". Our Sports Central. January 30, 2019. Retrieved February 6, 2019. ↑ "Apollos shine in night of firsts for the Alliance". The Alliance. February 10, 2019. Retrieved February 10, 2019. ↑ "Gilbert, Reaser named alliance players of the week". Tom Alexander/The Alliance. February 19, 2019. Retrieved February 19, 2019. ↑ Bohls, Kirk (December 7, 2007). "Lake Travis' Gilbert is a grounded but premier passer". Austin American-Statesman. Archived from the original on September 12, 2012. Retrieved February 23, 2008.